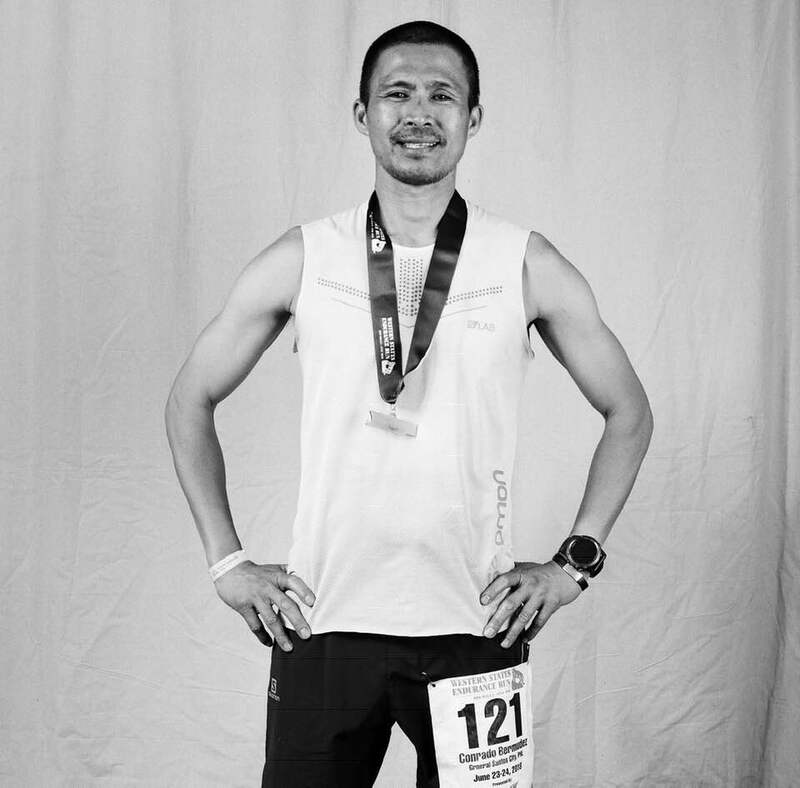 Sometime in August 2015, I featured Conrado “Jun” Bermudez, Jr in this blog as the First Filipino Runner/Ultrarunner to have finished a 200-Mile Mountain Trail Single-Stage Endurance Race at the Bigfoot 200-Mile Endurance Race in Washington State, USA. It was in the post in this blog where I wrote about his background and running accomplishments since he became a passionate runner. For this year, 2018, he finished the Ultimate Award in Ultrarunning in the United States which is the “Grand Slam of Ultrarunning” Eagle Award and I was able to send him an e-mail to congratulate him on this inspiring feat which is considered as a “dream” to be accomplished among the best ultarrunners in the world. I also sent him some questions to answer of which I am now publishing his answers in this blog. BR: Congratulations on your 2018 US Grand Slam of Ultrarunning finish! 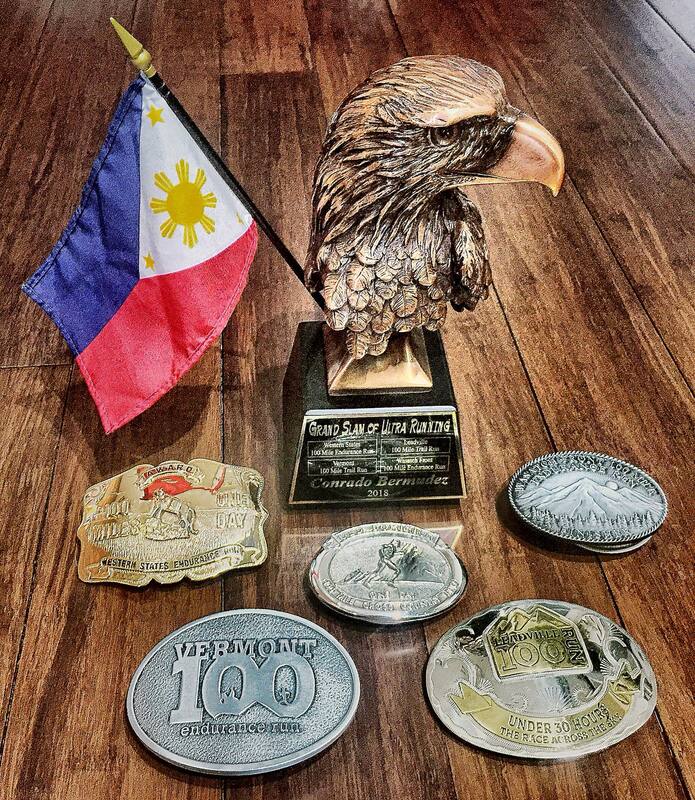 That’s a huge accomplishment and biggest pride for being the First Filipino to receive the Eagle Award in Ultrarunning. You are now Finisher #354 out of the 363 Finishers of the GSU since this award was created in 1986. As usual, hoping that you will have the time, I am sending you some questions for you to answer which I will publish in my blog. There is no deadline though as I know you are still resting and recovering. Jun: Thank you for this opportunity to be included on your blog, sir. Thank you also for mentoring me when I started my ultrarunning way back in 2013. As a Filipino citizen, it is a great pleasure and honor to represent our country in this sporting event. My heartfelt gratitude to all the support! As a 45 year-old runner, joining the Grand Slam was a no-brainer. There was no shadow of doubt not to join. It was a once-in-a-lifetime opportunity and this chance may not be available to me in the future. If it is going to happen by that time, I may not be physically that capable anymore for the challenge due to old age. BR: What is your feeling now that you have finished the US Grand Slam of Ultraruning with an impressive time of 106:52:09 hours and the First Filipino to have received the prestigious Eagle Award in Ultrarunning? Jun: I am deeply delighted and humbled to be part of this 32nd year of the Grand Slam of Ultrarunning, a special historical event in ultrarunning world. It still feels surreal that I was able to finish them and trace the footprints of the first finisher, Thomas Green, in 1986 and the grandfathers of the five 100 milers. These races are the oldest 100 milers in the US or probably in the world with the Old Dominion 100-Mille Cross Country Run for 40 years, Western States 100-Mile Endurance Run for 41 years (the oldest in the world), Vermont 100-Mile Endurance Run for 30 years, Leadville Trail 100 Run for 35 years, and the Wasatch Front 100-Mile Endurance Run for 38 years. Just to be entered in the Grand Slam of Ultrarunning events, itself, is a privilege. It takes a lot of luck in the lotteries (Western States 100, Leadville 100, Wasatch 100) to get entered in the same year. All of the races, except Wasatch 100, do not give provisional entry anymore. For non-lottery events, the Vermont 100 is a first-come-first-served basis and the registration sold out in less than 15 minutes when it opened, and the Old Dominion 100 got filled up weeks before the event date which normally did not happen in previous years. My success was not possible without the support of my friends and, of course, the encouragement, the love and understanding of my wife and my daughter. BR: You are one of the few Eagle awardees who finished and completed the FIVE Races in a span of three months, what was your recovery in between these races? Jun: The Grand Slam is arduous to complete. The three to four weeks of minimal time for recovery between races and the cumulative fatigue put so much toll on our body. I ran two road marathons in April (Boston and New Jersey) prior to the Old Dominion 100 (02 June). I started my taper three weeks before the race day so my body could fully recover. In between races, my first week of recovery consisted of moderate stretching and no running, which were slow hiking and light spinning workout. For the first two days after the race, I was doing ice therapy on my feet to remove the inflammation. And mostly during the period, I was doing a dynamic compression of my legs to flush out waste and hasten muscular recovery. Also, I am sleeping with my legs elevated almost every night even when I am not on training because I spend so much time on my feet at work with the load (tactical gear) on my body. I was taking Essential Amino Acids (EAA’s) complex to include Branched Chain Amino Acids (BCAA’s) to stop muscle tissue breakdown and reduce muscle soreness. It would take three to four days after the race for my legs to feel fresh and pain-free again. I was also consistent with my bodyweight strength workouts all throughout the Grand Slam. In the second week and onwards, my recovery usually started with 30 minutes of easy running then alternated the next days with spinning and short tempo or intervals (controlled pace) on the treadmill. taking two nights of having eight to ten hours of sleep two to three nights before the event so I would regain my energy and not be sleepy during the race. Although my recovery plan was not perfectly executed, I was still able to prevent injury and was able bounce back to be prepared for another adventure, and nailed them one by one to enjoy the experience. BR: It seems that you did not have any “issues or concerns/injury” in every race, how did you manage to fight the “demons” (heat, exhaustion, muscle cramps, if any, GI issues, altitude, and “bonking”) during these races? What was the “hardest race” in this series of race? Jun: My body held up very well. I do not have injuries since I started running ultras in 2013 except for my sprained ankle that I twisted during the HURT 100-Mile training in early December last year. I think my training on incline trainer/treadmill has preserved my legs to be stressed and injury-free. With my work schedule, at least 85% of my training was conducted indoor. 100 miles is a long journey but a manageable distance. For that long, I experienced nausea, vomiting, GI issue, and cramping during races. But I embraced them as my “normal”. I approached these races in a simple way, to control them by avoiding mistakes. As my spiritual endeavor, I ran the five races solo (no pacer, no crew) and dug myself deeper and fighting the adversities alone. One key to success is I put my heart and soul in this endeavor. In my training, I focused on the elements that could eventually hit me during races. Since these are summer series, heat is the biggest factor. The US west coast has a dry heat with extremely high temperatures while the east coast has high humidity that brings to higher heat index. Twice or Thrice a week I was doing heat training on my incline trainer from one hour to a maximum of five hours wearing a double layer of thermal gear and raising our room temperature to make it hotter. To complement my heat training, I was wearing my armored vest at work for the whole day even during the hottest days. During the race, I was wearing a hat, bandana, and arm sleeves where I placed ice cubes in them. All of these help to neutralize my body temperature. So, for heat, I was really prepared and it did not bother me during the races. Another element that is quite difficult to prepare is altitude. It is the most dominant factor that resulted to a huge number of DNF (Did Not Finish). Shown are the high altitude races of the Grand Slam with their corresponding highest elevation: Western States 100 (8,750 ft/2,667 masl), Leadville 100 (12,600 ft/3,840 masl), and Wasatch 100 (10,467 ft/3,190 masl). There are also significant sections of the courses that are above tree line. This is my weak point as a sea level flatlander. I incorporated speed work on my training since running on altitude is ran at slower pace. Although it does not really contribute on acclimation, it is still beneficial to run the race faster in order to have enough buffer from the cutoff and finish it with less pressure. Among the Grand Slam events, the Old Dominion 100 and Vermont 100 have the fastest courses with 66.27% and 79% finish rate, respectively. Old Dominion has a cutoff of 28 hours. They are a runner’s race since the climbs are not long and steep. But the Old Dominion could be surprising. The Sherman Gap section is a steep technical climb. These two courses are on low elevation but with high humidity. In Western States 100, I suffered a lot of cramping in most parts of my legs starting at the early miles until halfway. The second half was even worse when I had a stomach issue. The course is point to point mountainous terrain but it got easier in the second half with the course going more downhill than uphill. I felt that among these races, my body was beaten up the most here. Despite the heat, it has 81% of finish rate. In Leadville 100, cramping was not that significant but I was nauseous the whole time. I did not have solid food intake all throughout the race. Every solid I took just went out. I went to Colorado 13 days before the race. But even with acclimation, breathing during a long climb in Hope Pass was a struggle. The air is just so thin that I could not push hard. The cutoff of 30 hours also made the race harder. The high altitude and fast cutoff contributed to a low finish rate of 57.9%. The most difficult event for me is the Wasatch 100. It has a 62% finish rate. After four races, my body was not primed to run anymore, especially that my legs felt sluggish. The nausea hit me after a quarter of the race and I could not take solid food again. The course has more climbing and it is on high elevation. It was also the second hottest temperature in the history of the race. This year a significant number of bees were scattered in different sections of the course, which was difficult to avoid. Some got stung 14 times. Fortunately, I was only hit twice. Although this is the most technical course of the Grand Slam, this also has the most beautiful scenery. During this race as I was to retrospect the past four races, and the long journey of trials and tribulations, I was feeling highly and spiritually rejuvenated since it is already the finale of my Grand Slam journey. I have some friends and compatriots who shared the trails with me and it lifted my spirit and energy. Thanks to Casey Fisher (Old Dominion, Western States, Leadville), Jovencio Luspian (Western States), Tim Aquino (Leadville), Kian Vicera(Leadville), Philip Pagdanganan (Leadville and Wasatch), and Ryan Espulgar (Wasatch) for friendship. The memories we have will be forever etched in my heart. BR: What would you recommend or advise to Filipino Ultrarunners who would plan to complete or join this series of Ultrarunning Races? Jun: The new system of the Grand Slam (started two years ago), which includes four of the five events with Wasatch 100 as a mandatory race, has given more opportunities for runners to join without undergoing through the virtually impossible selection process of the Western States 100. The Grand Slam events per se involves time and money. As a starter, if a runner can afford the financial and logistical burden, and manage the time schedule, non-running-wise, he is ready to tackle the series. We just live once anyway. Taking the Grand Slam challenge is a priceless opportunity and a big milestone. In my personal point of view, the core of the Grand Slam are the Western States and the Leadville, aside from Wasatch Front which is mandatory. Missing either one of them could mean not a “complete” satisfaction for me. Leadville is known for being a grandslam-killer. And these two races are icons in the annals of the 100-mile races worldwide, especially the Grand Slam series. Another step is to find a Western States 100 qualifying race that has more climbing and elevation in order to get used to the mountainous course. Applying for lottery every year gets a runner more chance to be picked. In Leadville 100, there’s a 50% chance to be selected in the lottery. In the essay part of the application/registration, a runner has to indicate his willingness to be entered into the Grand Slam and make a convincing story of his running journey to get a better chance to be selected. Although it is a lottery, I still believe that the race organizer gives considerations to this special request. Wasatch Front 100 is the mandatory and final race of the Grand Slam. It is also a lottery and the chance of getting in is high. If in case a GS entrant will not get picked in the lottery, the race organizer gives a provisional entry, meaning the entrant has a chance to run Wasatch if he is successful on his third race. Another aspect to consider is the physical and mental readiness of the runner. Experience is a huge factor. So, doing back to back races that have difficult terrain is a good test. This is also to develop the physical stamina as well as to harden the mental fortitude of the runner. Most of the time, it is the indomitable spirit that brings the runner to the finish line. BR: Having closely followed your Ultrarunning feats and accomplishments, you have only 2 DNFs, Barkley Marathons and UTMB. You redeem yourself in the 2017 UTMB and you finished in one of the coldest UTMB race. Do you have plans of going back to Barkley? What are your future races? Jun: The Barkley is not in my thoughts right now. Being out there knowing the difficulty of the course, that five loops is an impossible feat. It is arguably the toughest race I ever experienced. I gave my all and had managed to finish one loop. I do not have a definite race for next year except for the Boston Marathon. I threw my name for lotteries in Hardrock 100 (5th year application) and Western States 100 (1st year application after getting in this year). There are some interesting races that I want to do in the future, maybe another mountain 200 miler and road ultramarathon. Some of the races that I did are also worth coming back. I love the electrifying spirit of UTMB, Leadville, and Western States, and also the old traditional and small community feel of the Old Dominion. BR: Lastly, Did you get the services of a Professional Coach in preparation for this year’s events and what shoes did you use in your Grand Slam Races? Jun: I did not get the services of a Professional Coach and I did my training on my own. I used the Hoka One One Mafate Speed 2 for Old Dominion and Western States and Hoka One One Mafate EVO for Vermont, Leadville and Wasatch Front. Thank you, Jun for answering my questions. Your answers are considered as “Gold Mine” for those ultra runners, Filipinos or Non-Filipinos, dreaming to be a Finisher of the US Grand Slam of Ultrarunning. Keep inspiring us and good luck on your future runs/races.